Like most of a fascinated sports world, I waited patiently for Tiger Woods to grant his post-Bay Hill victory interview on The Golf Channel on Monday. It took him about 15 seconds to get to Steve Sands for the greenside chat, and I imagine that's because he told Sands: "Hang on, Sandsy. Let me slip on this giant foam finger that reads 'I'M NUMBER ONE,' flash it toward the haters, the press and the haters in the press and I'll get right to you." Holy smokes. Tiger Woods just accomplished one of the greatest feats of his career. Right next to winning four consecutive majors from 2000-01, right next to winning six consecutive U.S. Junior Amateurs and U.S. 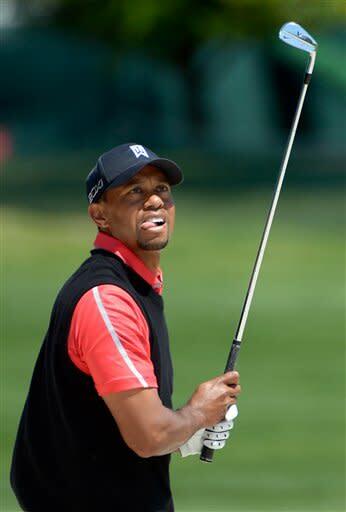 Amateurs, right next to 77 PGA Tour wins by age 37, I'll put "The Long Climb Back" on Tiger's all-time ledger. By winning at Bay Hill on Monday, Tiger Woods is No. 1 in the world again – for the first time since October 2010, for the first time since falling to No. 58 in the world, and for the first time since his cloak of invincibility disappeared with a public fall from grace. And right next to that statistical fact – Numero Uno says the computer – I'd put perhaps an even more important, less numerically definable achievement: The Reclaiming of The Aura. It's taken six wins in his last 20 PGA Tour starts, it's taken the miracle resurrection of a putter last seen in George W. Bush's first term, and it's taken the convenient digression of Rory McIlroy's career arc, but Tiger is back to being, well, Tiger. By that, I mean The Big Kahuna, El Grande Queso, His Tigerness. No, he doesn't need to win a major to regain his status as the Elvis Presley/Mick Jagger/Jay-Z of golf. He's back in players' heads already, back rattling their comfort zones, back to the point where his name on the leader board causes bouts of gastric discomfort among the field. Surely, you saw Justin Rose on Saturday throw four bogeys on his back nine to cough up an afternoon lead and hand the 54-hole lead to Tiger. Surely, you saw Rickie Fowler rinse two golf balls and post a snowman on the 16th hole Monday when he had crept within two shots of Tiger. And surely you saw this quote from Keegan Bradley, a player you'd think was so young and so free of Tiger-issued scar tissue that he'd represent the new breed of challenger: "I feel like this is the Tiger I grew up watching." Heavenly choirs and Bach sonatas could never sound as beautiful to Tiger Woods than those words from one of the poster boys of the next generation. It's the best of all possible worlds for Tiger. He spent the past 15 years obliterating one generation of golfers, only to fall on his face in humiliating fashion, opening the door for the Rory-Keegan-Rickie generation to charge in, carrying the "If It's Too Loud/You're Too Old" flag for the new millennium. And they tried to do their parts, really. Rory won those two majors in historic style, and ascended to the top rung. Keegan even won a major and became a star. But now, over the course of three years, and with – as Tiger said on Monday after his win – "hard work and patience," those time-tested virtues, he's right back in their faces. He's their childhood TV idol, in the flesh and in a red shirt. He's a mythical figure, now very real trying to take what they thought could be theirs: victory and glory. From 2010-12, things were different. Tiger had lost his aura. Tiger had lost his putter. Tiger had lost his health. Tiger's personal life was a mess. Rory was the new star. Everybody saw it, everybody said it. Johnny Miller said it. Nick Faldo said it. Any number of scribes, including yours truly, said it. But things change. Putting mechanics get fixed. Young stars change golf clubs for big money. Knees heal up. New love and emotional security blossoms. Time marches on. The present is ever fluid, ever ripe for a new moment. Tiger seized on this Zen philosophy, got better, got fixed and created a new narrative. The future is so tantalizing, so fun to ponder. Miller wondered on The Golf Channel if being relieved of the No. 1 spot will "free" McIlroy, will allow him to play unburdened. Some still wonder if Tiger can win a major now, given the obvious self-imposed pressure he places on himself to topple Jack Nicklaus. Some wonder if Tiger is a "horse for a course," meaning his wins at Torrey Pines and Doral and Bay Hill are as much about familiarity and muscle memory as anything else, that doing it at Merion's U.S. Open is a different deal. Well, if Tiger is a "horse for a course," Augusta National is a familiar paddock. We'll see him there next, on Thursday, April 11, for the first round. You'll recognize him. He'll be the No. 1-ranked player in the world, playing like it, acting like it and, best of all, knowing that everybody knows it. 65-72-70-70 – 11-under 277, Justin Rose, second place, Arnold Palmer Invitational, Bay Hill GC, Orlando, Fla. In three stroke-play events on the PGA Tour this year, Rose has a tie four fourth (Honda), tie for eighth (Doral) and now a first-place medal in the Bay Hill "Non-Tiger Flight." What to make of this intriguing 32-year-old Englishman who looms as a dark horse at Augusta National in two weeks? That is, if the No. 3-ranked player in the world can fairly be called a dark horse. Just last year, Rose finished top-10 at both the Masters and the PGA Championship, although he remains major-less in his career, despite eight wins in America and Europe since turning pro in 1998. He's won Jack's Memorial, last year's Doral and a FedEx Cup playoff event, so he doesn't shy away from the big stage. But to see Rose pin those four bogeys on the board on Saturday's back nine, and to see him putt the ball – not always pretty – is to wonder if this red-hot player with a world of talent can be the man to wear green one day soon. His ball-striking and driving of the golf ball remains among the best on tour, and his gentlemanly ways have earned him many a friend in the press tent. Plus, he's playing dynamite golf so far this year. Justin Rose remains a hot name to watch, but frustrating in some ways, as well. Didn't have to dig too deep for this week's Mully o' the Week. There stood Rickie Fowler, 24 years old and still in search of a career-defining moment. Paired with Tiger Woods in the final twosome at Bay Hill, Fowler had to fight many things – Tiger's otherworldly record with a 54-hole lead, Tiger's "home course" factor, Fowler's own nerves and the searing memory of his last final-round, last-group pairing with Tiger at the 2012 Memorial, where Fowler shot – cough, cough – an 84. Yes, I wrote it. Eighty-four. And after playing level par through eight holes while Tiger played the holes in 2-under, it appeared Fowler would slowly fade away, wearing another uninspiring performance when he had a chance to inspire. But! The orange-slacked wonder stood up! He made birdie on No. 9. And on No. 12. And on No. 14. And when he and Tiger traded bogeys on the 15th hole, Fowler came to the 16th hole only two strokes down, with a real chance for drama. Plus, Tiger drove into a fairway bunker at No. 16. If Fowler could make eagle from the fairway on the very eagle-able 16th hole, Bay Hill would rattle with roars of a challenge. Except … from the fairway, 180 yards out, Fowler dunked his shot in the water hazard. Wet. Cue sad trombone. But don't put that trombone away. He rinsed a second ball, too. He'd make triple-bogey eight on one of the Florida Swing's easiest holes. Cue sad trombone again. Since we all like Rickie Fowler, and we all like his "I'm Goin' Flat Bills" chorus in the very fun Golf Boys video, and since the young Californian would benefit so much from a smack-down with Tiger, let's go back out to No. 16, relax Rickie with a chorus of some Golf Boys tunes in his head and … give that orange-slacked man a mulligan! "He needs a tree iron." – Bill Kratzert, The Golf Channel, as Sergio Garcia pondered a shot in between the limbs. Rimshot! Pretty good line from Kratzert as a surreal three-minute span of video played out early Sunday at Bay Hill. Sergio Garcia's tee shot on the 10th hole, incredibly, nestled in a tree. Perhaps more incredibly, it rested in full sight from the ground, at the base of three limbs. And perhaps most incredibly, Sergio went up, up, up into the tree – and played a golf shot. It took El Nino in El-Tree-o about two minutes to figure out the best way to straddle the limbs and make a pass at it, and if you ever doubted Garcia's ability to best figure out how to hit a golf shot in a maze of thick tree limbs after climbing the tree while wearing expensive slacks, you've been selling the Spaniard short. Sports hadn't seen such a dramatic tree climb since Ahmad Abdul Rahim of "The Bad News Bears" took refuge in the branches after dropping fly balls, only to be talked down by Walter Matthau's Buttermaker. Garcia wasn't pouting like Ahmad, though. He was there to hit a sweet golf shot. Sergio looked at his golf ball's lie through different stances, different angles, different swing thoughts, all the while eight feet off the ground. Incredibly, the shot he decided on featured him facing away from the ball, hitting a wedge with one hand, backward – cleanly and purely, on to the fairway, as the gallery roared its respect for the wizardry. As if to punctuate the madness of the scene, Sergio then leaped down from the tree, like un gato. Someone on The Golf Channel cracked that he earned a "9.8 for the dismount." Sadly, Garcia made a double-bogey six on the hole, and then announced his withdrawal when the storm hit, citing an Achilles injury. In truth, he had to W/D. After all, how could he top "The Lay Up From the Limbs"? It was the golf equivalent of dropping the mic and walking off the stage. Cue "Dueling Banjos." Young Rory plays his final pre-Masters tuneup at the Shell Houston Open this week. How does he answer Tiger in the golf equivalent of Eminem's rap-off in "Eight Mile"? If Rory McIlroy wins at Houston, he supplants Tiger at No. 1. What a story that would be – especially because Rory McIlroy's golf game this year, with the new Nike irons, with the attendant scrutiny, with the memory of the walk-off, does not indicate anything close to victory is possible. But, as a wise man once said: That's why they play the game. You never know. Except, after Tiger's statement this week, we sometimes do know.